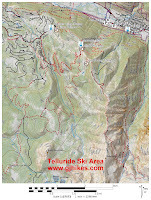 The Village trail is located in the Telluride Ski Area of the Uncompahgre National Forest near Telluride, Colorado. The upper end of the trail begins across from the Nature Center a short distance from the St. Sophia Gondola Station and ends at Mountain Village. The trail is very popular with both hikers and mountain bikers. 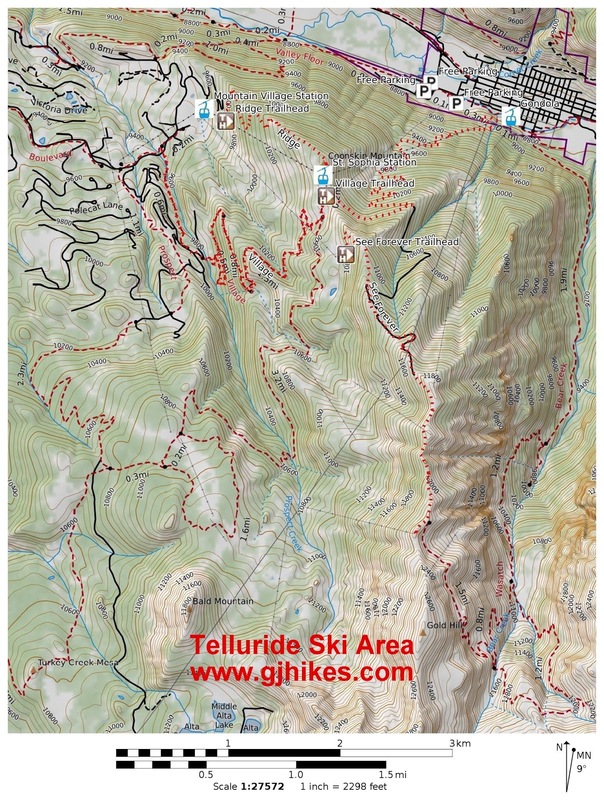 The easiest way to get to the upper Village trailhead is to park in one of the free parking lots in Telluride and follow the San Miguel River trail to the Telluride Station where you can take a free gondola ride up the mountain to the St. Sophia Station. The gondolas can accommodate both pets and mountain bikes. After exiting the St. Sophia Station hike past the restrooms and other buildings for a hundred yards or so where the Village trailhead will be on the right a little past the Nature Center. As the trail gets going it crosses at least one ski run and passes the spot where the Prospect trail branches off on the left. The Prospect trail is a 10.7 mile route that is good for hiking but most popular with mountain bikers. The Village trail keeps switching directions back and forth across the ski runs as it works its way down the mountain. Besides making it easier for mountain bikers the switchbacks provide some nice views of the surroundings as the trail travels out in the open. Eventually the trail enters the trees as it progresses from east to west across the slopes briefly coming back out into the open each time it finds another ski run to cross. Lower parts of the mountain see the dark forest of pines giving way to more brightly lit stands of aspens. The Village trail takes advantage of a few sections of double track in several places. As the trail reaches the residential area of Mountain Village it spills out onto the local streets. After navigating the route for a ways with the aid of a few 'Village Trail' signs the trail once again ducks into the trees and continues as a single track. Through this area the hike and bike routes separate so the mountain bikers can take advantage of a few trail features that were designed especially for them. The Village trail comes to an end in Mountain Village when it meets up with the Boulevard trail. For this post we found our way from the lower end of the Village trail to the Village Center where we road the gondola back up to the St. Sophia Station and then on down the mountain to Telluride. There weren't much in the way of signs pointing the way to the gondola but it becomes more obvious the closer you get. Various shops and places to eat around the Heritage Plaza might be worth checking out while you are passing through. The whole area has a nice relaxing atmosphere. As far as the Village trail goes, it was getting quite a bit of use on the day that we were there from both hikers and mountain bikers. If you would like to see it for yourself then all you have to do is grab your bike or 'Take a hike'.